What is new with Medieval Magic. All right everyone here it is. Look for some great sales and fabulous new items over the next month for Halloween. Costumes, Ornaments, and anything scary we can come up with. It is time to fright for the scariest ideas of the season. I have some suede left from the festivals and will be making some new items for our costume section. Along with some heavier leather for some scary new accents. We will also be bringing in some items for accessories to go with them. So keep an eye on our Garb and Costume section. We do have a few custom orders for the holidays, but still have room for a few more. As our goal is to bring our Customers the highest quality and variety we would be happy to hear from our readers about any items they would like to have available. Please click Here to let us know. 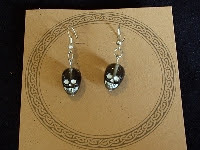 Smoky Black Glass Skull Earrings. Hypoallergenic earring hooks. Earrings hang 4 cm’s. Skulls are 1.5 cm x 1 cm x 1 cm. Please see our necklaces if you are interested in a matched set, as I have also used this skull for necklaces. Wicca is the religion of Witchcraft or Wisecraft. It is based on the spirituality of our ancestors - a worship of Goddess, God and the natural universe - in a form meaningful to women and men today. Wicca is a magical path witch empowers us to grow, change and heal. It is a harmony with the universe, others and ourselves.This introductory guide explains:Witchcraft ancient and modernthe Divine as Goddess and Godveneration of Naturemagic and spellcraftcreating ritualwhere to find out more. We have placed all children’s costumes at 50% off. And for the rest of the month keep an eye on our “Sales” category for any others prices that may “drop” dead. Aug.-Sept. Contest - We would like to Congratulate RENEE for winning our Aug.-Sept. Contest. The contest prize was a $10 Certificate to our site. Our current contest for a $10.00 gift certificate will run from Oct. 1st till October 31st, 2007.You must find this picture to enter. Just tell us the day and what the sku # is. 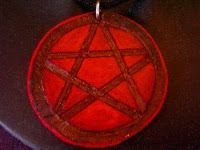 Like a Christian cross, the pentagram tends to be the religious symbol of the Pagan religions. It encompasses elemental beliefs and is one of the strongest protective amulets ever "designed". The Pentagram dates back thousands of years to pre-Babylonian Sumer, roughly about 3500 BC. Many religions have once used this symbol; the Jewish people saw it as a symbol of the Five Books of Moses, and Christians once used it as a protective amulet. According to Heather Child's Christian Symbols, Ancient and Modern, the pentagram is a symbol of the five senses. Also, when the letters S, A, L, V, and S are inscribed in the points, the pentagram is a symbol of health. It has been called such things as the Druid's Foot and the Witches' Star. The Druzee, descendents of exiles from Fatimid Dynasty-ruled Egypt also keep a five-colored pentagram as their symbol. The pentagram appears on the shield of Sir Gawain in the 14th Century poem, Sir Gawain and the Green Knight. In the poem the five lines of the star are given multiple meanings: they represent the five senses, five fingers, the five wounds of Christ, the five joys that Mary had of Jesus (the Annunciation, the Nativity, the Resurrection, the Ascension and the Assumption), and the five virtues of knighthood which Gawain hopes to embody: frankness, fellowship, purity, courtesy and compassion. It would seem as though the Pentacle is gaining a new meaning in Modern-day Paganism, in that it is seen as a unifying symbol of the Pagan community. In modern day Witch Craft, the Pentacle tends to be used more than the pentagram. Each point of the Pentagram traditionally represents one of the five metaphysical elements of the ancients. The pentagram represents Spirit ruling over the four elements. The Pentacle is simply a pentagram with a circle around it. This symbolizes eternity, totality, and unity. It emphasizes the interconnectivity of all of the elements. The direct and indirect relation of one element to the other. Water (West): Emotion, Intuition, Compassion, Sleep, Meditation, Purification, Prophetic Dreams, Healing, Love, Friendships, Fidelity (Upper right hand corner) - Represents Emotions and Intuition. The Circle (Around the Star) - Represents the God-Goddess it refracts and reflects all Light, bringing to the wearer Intelligence, Universal Wisdom, and Protection. If you would like to submit an article, question or Business Ad for the newsletter, we welcome your submission. Please see the Newsletter section on our site for submission deadlines and conditions.